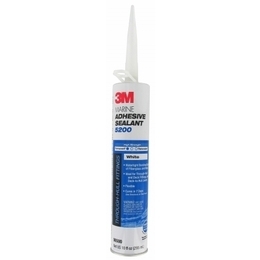 10oz empty caulk tubes are available here for purchase. 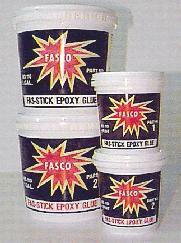 These are good for filling with the Fasco 110 glue for applying in thin lines or into tight areas. Two Part putty type glue with epoxy resin base, once mixed the glue yields an exceptional strength unmatched by most other adhesives. Excellent adhesion to wood, metal, fiberglass, foam, concrete and stone. Offers a 10 to 15 minute working time. 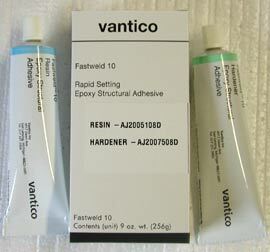 An exceptionally rapid setting(10Minute) two part epoxy adhesive paste. Good bonds to many different surfaces, Especially suited for the bonding of small parts and/or repair work. Six10® Thickened Epoxy Adhesive combines the strength and reliability and excellent physical properties of a two-part WEST SYSTEM® Brand Epoxy with point-and-shoot convenience. The self-metering coaxial cartridge dispenses a gap-filling structural epoxy that bonds tenaciously to wood, metals, fiberglass and concrete. The tube comes with a static mixer that lets you lay down a bead of thickened epoxy with any standard caulking gun. These mixing tips are designed to be used with the West Six10 Epoxy Adhesive Tubes. The extra tips will allow you to only use a small amount at a time by disposing of the old tip and using a new one when you are ready. 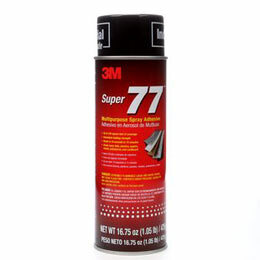 Strong, transparent, fast drying adhesive for permanently attaching foils, cloth, carpet, foams, paper, carboard, etc... To painted or unpainted metals, wood, or other base materials.